Charles Darwin’s masterwork, On the Origin of Species, was published in November 1859. It initiated a revolution in science that continues to this day. Although Darwin’s political views were far from radical, his insights became the central weapons in the battle to establish materialist science as the basis for our understanding of the world, and contributed to the development of Marxism. Charles Robert Darwin was, to say the least, an unlikely revolutionary. His father was a prominent physician and wealthy investor; his grandfather was Josiah Wedgwood, founder of one of the largest manufacturing companies in Europe. He could have lived a life of leisure — instead he devoted his life to science. 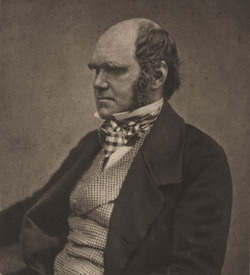 After graduating from Cambridge in 1831, 22-year-old Charles Darwin boarded the British survey ship HMS Beagle as an unpaid naturalist, subsidized by his doting father. When he returned after five years, he had thousands of pages of scientific observations, over 1,500 carefully preserved specimens — and growing doubts about the dominant scientific and religious ideas of his day. At that time, Darwin wrote in his 1861 introduction to Origin, "the great majority of naturalists believed that species were immutable productions, and had been separately created." Biblical literalists and deists alike agreed that species were fixed by divine law. Dogs might vary in appearance, but dogs don’t give birth to cats. After five years of travel and two years of study at home, Darwin came to a heretical conclusion: species were not immutable. All animals were descended from common ancestors, different species resulted from gradual changes over millions of years, and God had nothing to do with it. It is difficult, today, to understand how shocking this idea would be to the middle and upper classes of Darwin’s time. Religion wasn’t just the “opium of the masses”— it gave the wealthy moral justification for their privileged lives in a world of constant change and gross inequality. The world was unfolding according to God’s wishes, and anyone who questioned that endangered the very fragile social order. Nevertheless, by the 1830s educated people knew that the Genesis creation story couldn’t be literally true. The rise of capitalism in the 1700s had led to booms in mining and canal building: those works exposed geological layers and ancient fossils that clearly contradicted the idea of a recently-created earth. In the same period, imperialism led to global exploration and the discovery of more varieties of plant and animal life than any European had ever imagined. Why had the Creator been so extravagant? And why, if each animal was created separately, were their underlying structures so similar — why do bats' wings, whales' flippers, lions' paws and human hands all contain the same bones? Many attempts were made to preserve a central role for God and creation in the face of this evidence. Perhaps the most sophisticated was developed in the 1850s by Richard Owen, head of natural science at the British Museum and inventor of the word "dinosaur." He argued that all animals are variations on ideas — "archetypes" — in God's mind. God "foreknew all variations" on those archetypes, and made them real in forms that would suit various environments or situations over time. At the opposite end of the philosophical spectrum, the great French biologist Jean-Baptiste Lamarck offered a non-religious explanation. He proposed that there is a “chain of being,” a ladder of life, with single-celled animals at the bottom and humans at the top. Nature constantly and spontaneously creates new creatures that have an innate drive to climb the ladder, becoming more complex, or perfect, over time. As they climb, they also adapt to environmental changes: giraffes have long necks because their ancestors had to stretch to reach high leaves, while fish that live in caves are blind because their ancestors’ vision declined as a result of disuse. This concept was not central to Lamarck’s theory, but “inheritance of acquired characteristics” has since become inextricably connected to his name. While Lamarck and others just speculated that species changed over time, Darwin provided convincing evidence. More important, he showed that it happened by natural processes, without any help from gods or mysterious progressive forces. That is, his explanation of evolution was materialist. In Darwin’s theory, three factors combine to create new species: variation, inheritance, and natural selection. There are many differences between the members of any species, and those differences will result in some individuals being more likely to survive environmental changes and so pass on their variations to the next generation. Over long periods of time, such variations will spread through the population, while any that reduce the possibility of reproduction will decline. Eventually the accumulation of new characteristics results in new species. Darwin developed the key elements of his theory by 1838, but didn’t publish it because he knew how hostile the scientific community of his day was to both materialism and evolution . Only after 20 years, when he had become one of the best-known and most respected naturalists in England, did he finally make his heresy public. On the Origin of Species was an instant best-seller. The publisher printed 1,250 copies but received orders for 1,500 copies on the first day. A second edition of 3,000 copies followed in a few weeks, and some 110,000 copies were sold in England by the end of the century. While Darwin’s ideas were quickly accepted by many scientists, especially younger ones, they were roundly condemned by the scientific establishment and by religious leaders. Adam Sedgwick, Darwin’s geology professor at Cambridge, called On the Origin of Species "utterly false and grievously mischievous" and declared his "detestation of the theory, because of its unflinching materialism," while Richard Owen denounced it as an "abuse of science." Outside official scientific circles, Darwin’s ideas found strong support in the workers movement. Friedrich Engels said Origin was "absolutely splendid," and Karl Marx called it "the book which contains the basis in natural history for our view." Marx’s friend Wilhelm Liebknecht later recalled that "when Darwin drew the conclusions from his research work and brought them to the knowledge of the public, we spoke of nothing else for months but Darwin and the enormous significance of his scientific discoveries." "Nature works dialectically and not metaphysically … she does not move in the eternal oneness of a perpetually recurring circle, but goes through a real historical evolution. In this connection, Darwin must be named before all others. He dealt the metaphysical conception of Nature the heaviest blow by his proof that all organic beings, plants, animals, and man himself, are the products of a process of evolution going on through millions of years." Darwin spent most of the rest of his life researching evolution and natural selection, while his supporters defended his ideas against the most influential opinion leaders of his day. By the time he died in 1882, few scientists still disputed the fact of evolution — but it took much longer for most to accept the materialist core of Darwin’s work, that variation and natural selection are the processes that drive evolution. For decades scientists searched for an alternative to natural selection that would be compatible with the idealist conception that God, or some equivalent progressive tendency in nature, guided evolution upwards until humans emerged as the pinnacle of creation. But twentieth century genetic research proved that Darwin was right all along: that variations occur naturally, and that natural selection is the main force determining which variations survive and spread. Darwin's commitment to naturalist science has triumphed. No modern scientist, not even one with deep religious convictions, would today suggest that "then a miracle happened" is an acceptable explanation for anything in nature, including the origins, immense variety and constant changes in life on our planet. This materialist victory in science is one of humanity's greatest achievements. For that reason alone, no matter what his hesitations, delays or prejudices, Charles Darwin deserves to be remembered and honoured by everyone who looks forward to the ending of superstition and ignorance in all aspects of life. The idea that nature has a history, that species come into existence, change and disappear through natural processes, is just as revolutionary, and just as important to socialist thought, as the idea that capitalism isn’t eternal but came into being at a given time and will one day disappear from the earth.